Guaranteed to entertain! 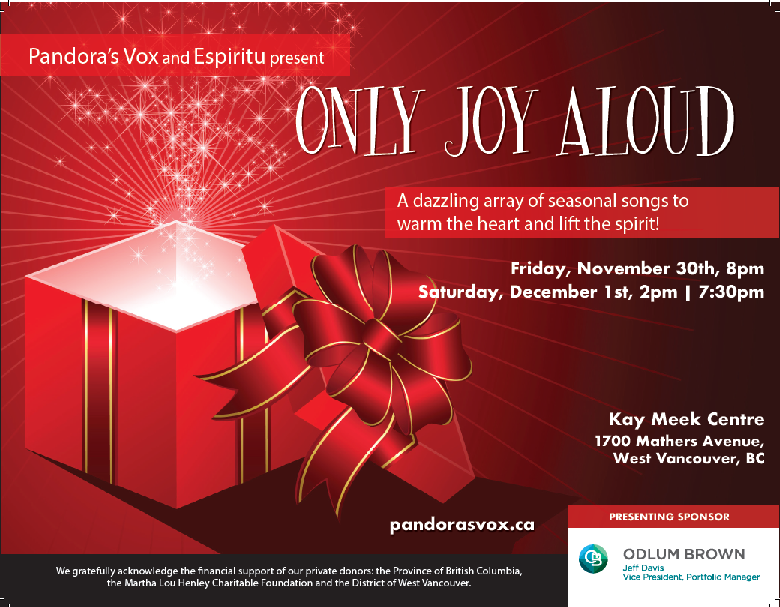 Two of Vancouver's celebrated vocal ensembles present their annual Christmas concerts ONLY JOY ALOUD, filled with vocal delights and seasonal surprises. Pandora's Vox, the award winning womens' ensemble join forces with the highly entertaining Espiritu Vocal Ensemble, all under the direction of Gillian Hunt. Featuring the talents of some of Vancouver's outstanding musicians and our guest performers, the beautiful ProArte dancers under the direction of Astrid Sherman. The concerts include traditional Christmas gems, popular holiday favourites and lots of surprises! Known for the beautiful staging and presentation, these shows attract a wide range of fans year after year and guarantee to warm the heart and lift the spirit! Buy tickets early to avoid disappointment."